If you want to make a full-time income online as a blogger, or if you want to defend your income during difficult times, then it makes sense to write more defensive themed articles and highlight more products can help people survive a downturn. One article example is, How To Protect Yourself From A Mass Layoff. Part of making better investment decisions is being able to better forecast the future. This is why I love writing goals and predictions posts because it helps me think about ways to better invest my money. Furthermore, my community can provide feedback as to things that I might be missing. Nobody knows the future, which is why crowdsourcing information is important. I’ve been anticipating a downturn for the past year. The economy always moves in 7-10 year cycles, and we’re currently in year seven. As a result, I’ve been focusing more on helping people generate multiple income streams and protect themselves from job cuts. The only defensive product I’ve produced is my book, How To Engineer Your Layoff: Make A Small Fortune By Saying Goodbye. I completely updated the book with 50 new pages for 2016 in anticipation of growing layoff concerns. As it turns out, sales have more than doubled YTD, despite a 56% increase in price to $75 after a $10 new year discount. Although the total income is still a minority portion of my overall income since I’ve got about 10 product channels, the absolute income level has become significant. Another defensive product I have is mortgage refinancing. The 10-year bond yield has collapsed to almost all-time lows, and everybody who has an ARM or a 30-year fixed mortgage should be refinancing if the rate is at least 0.375% lower and the break even point is under two years. At the very least, the break even point has to be shorter than the duration of ownership. The final defensive product is online savings. Cash is king in a downturn, and you want to help your readers find the highest savings interest rates possible. Online savings accounts provide far greater interest rates than bricks and mortar banks. Currently, my online income is structured as 70% offensive, 30% defensive. If my traffic stays the same, my online income will decline because offensive click through rates will decline more than the increase in defensive click through rates. This is the same concept of having a proper stock and bond allocation for your investment portfolio by age. The only way for me to grow my online revenue is by shifting to a more defensive mix, or growing traffic so much that it makes up for my offensive revenue stream. As a personal finance blogger, one of your main goals should be to help your readers grow their wealth. Hopefully, you can help them lose less in a downturn, and make more in an upturn. Downturns seldom last for only six months. I think we’re in for a rocky two year ride. 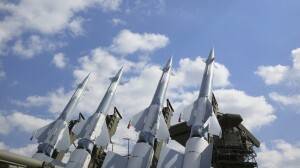 Therefore, use the first half of this year to write about more defensive topics. Even better is creating more defensive products of your own. You’ll not only help your readership, you’ll probably also make more money as a result. For those who want to sign up to be an affiliate of my main defensive product on severance negotiations, you can sign up here. My book is especially relevant to those who write about career tips, transitioning to entrepreneurship, lifehacking, or general wealth building strategies. Once you’ve developed multiple defensive income streams online, you can make a tremendous amount of money during good times and bad times as a professional blogger. Many pro bloggers make more than bankers, doctors, lawyers, and definitely journalists! Bloggers, what kind of defensive articles and products are you highlighting now that the bad times are here again? 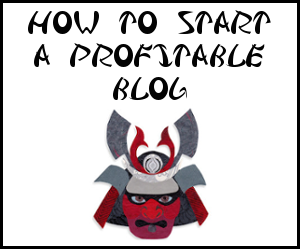 Looking to start your own blog? I’ve just created a new step-by-step guide. 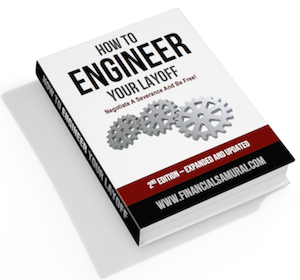 I love your How To Engineer Your Layoff book. It helped me immensely when I left my job of 10 years and I promote it quite often with my blog. It is pretty darn ugly out there in the stock market. I’m not panic selling though. I just try not to look at how much money I’m losing on a daily basis! I think things will rebound in the long run so I still plan to hold onto my existing positions since I’m not over concentrated and don’t invest in single name stocks. It does feel good that I have a chunk of cash in the bank though – I’m slowly deploying it each month to leg in while prices are down. It’s pretty bad to go through another recession, since the last one left many in pretty bad shape. I am currently working on a freelancing course that will help people create a successful small home based business. Weird enough, I went full time freelancing in 2009, when my country was hit hard by the recession. I lost my job, was in pretty thick debt and desperate, as you can guess. Maybe this course comes at the right time and would help others grow an income stream faster and be better prepared. I hope nothing truly bad happens this time. Supposedly, there is a Ponzi scheme even BIGGER than Bernie Madoff’s $65B one that has been uncovered. That would be bad if their positions aren’t unwound. I’ve been trying to register on your forums for sometime, but I never get the confirmation email? Any idea what’s up? But if we do my wife and I have spent the past year diversifying our income and plan to continue into 2017.